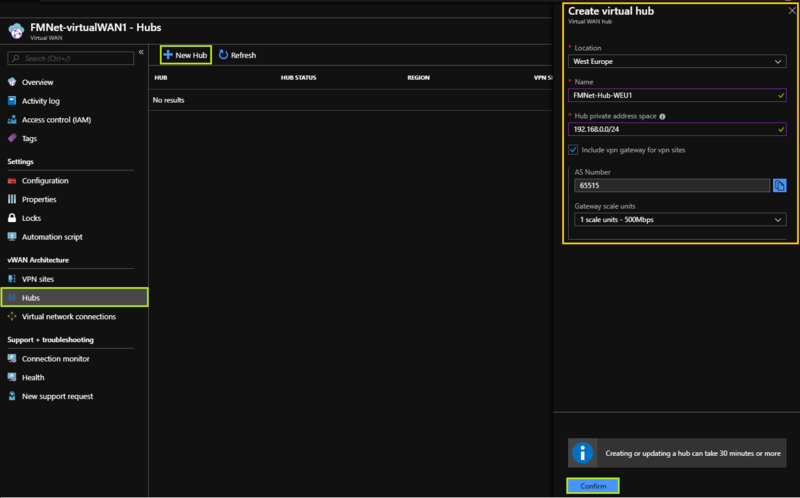 Azure Virtual WAN is a new network service that allows you to optimize and automate the branch-to-branch connectivity through Azure. 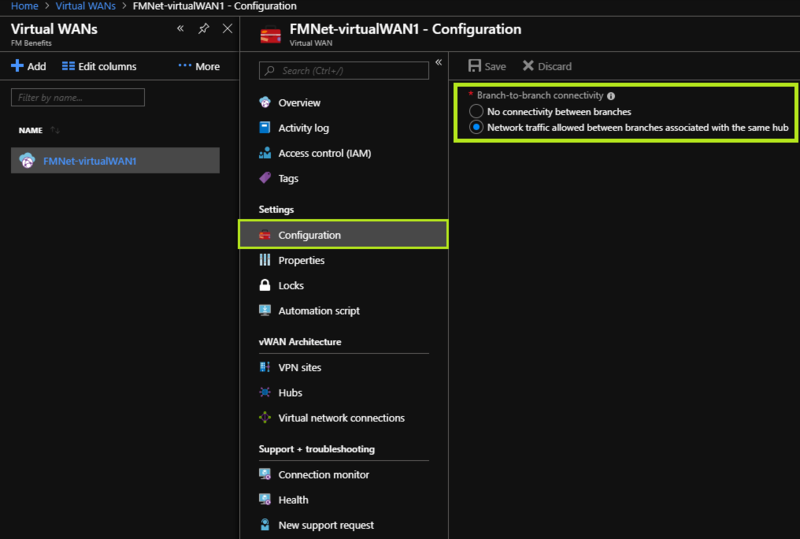 Thanks to this service you can connect and configure network devices in branch to allow communication with Azure (branch-to-Azure). 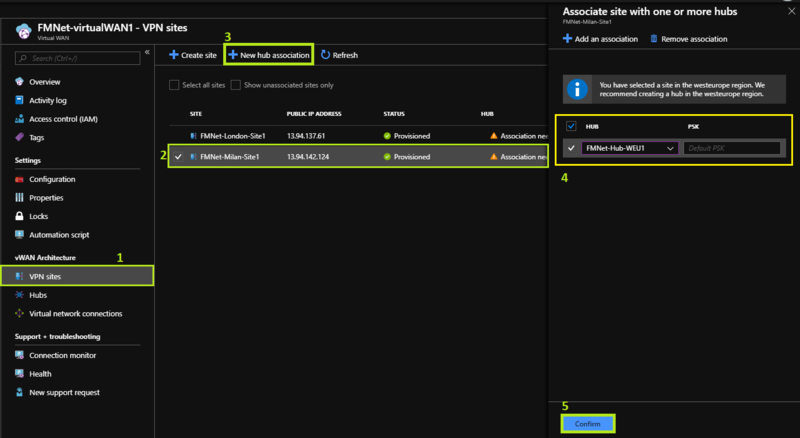 This article examines the components involved in Azure Virtual WAN and shows the procedure to be followed for its configuration. 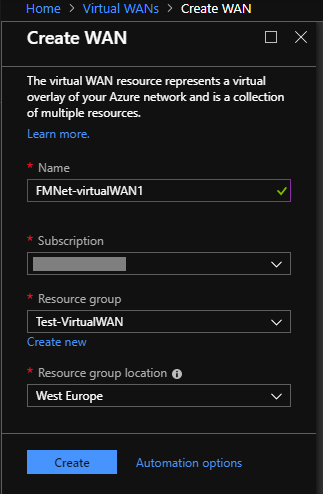 The Azure Virtual WAN configuration includes the creation of the following resources. The Virtual WAN resource represents a virtual layer of Azure network and collect different components. It is a layering that contains links to all the virtual hubs that you want to have inside the Virtual WAN. Virtual WAN resources are isolated and cannot contain common hubs. When creating the Virtual WAN resource you are prompted to specify a location. In reality it is a global resource that does not reside in a particular region, but you are prompted to specify it just to be able to manage and locate more easily. By enabling the option Network traffic allowed between branches associated with the same hub allows traffic between the various sites (VPN or ExpressRoute) associated with the same hub (branch-to-branch). The site represents the on-prem environment. You will need to create as many sites as are the physical location. For example, if you have a branch office in Milan, one in New York and one in London, you will need to create three separate sites, which contain their endpoints of network devices used to establish communication. If you are using Virtual WAN partner network equipment, provides solutions to natively export this information into the Azure environment. In the advanced settings you can enable BGP, which if activated becomes valid for all connections created for the specific site . 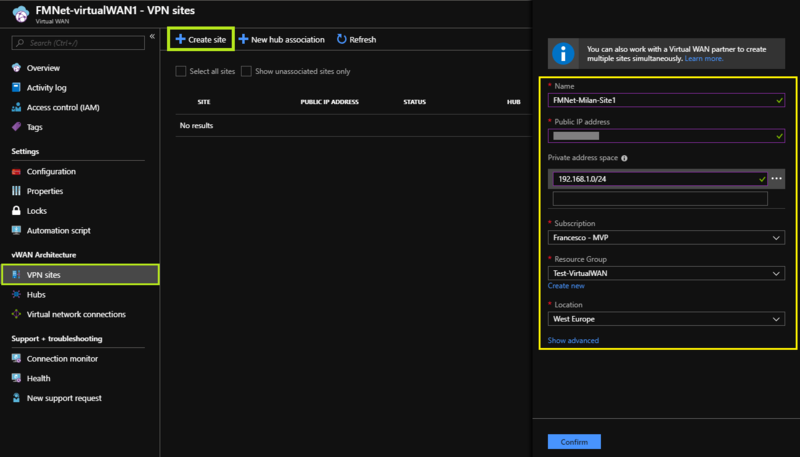 Among the optional fields you can specify device information, that may be of help to the Azure Team in case of any future enhancements or Azure support. A Virtual Hub is a Microsoft-managed virtual network. The hub is the core component of the network in a given region and there can be only one hub for Azure region. The hub contains different service endpoints to allow to establish connectivity with the on-prem environment. Creating a Virtual Hub involves the generation of a new VNet and optionally a new VPN Gateway. The Hub Gateway is not a classic virtual network gateway that is used for ExpressRoute connectivity and VPN and it is used to create a Site-to-site connection between the on-prem environment and the hub. The Hubs should be associated with sites residing in the same region where there are the VNet. The resource Hub virtual network connection is used to connect the hub with the virtual network. 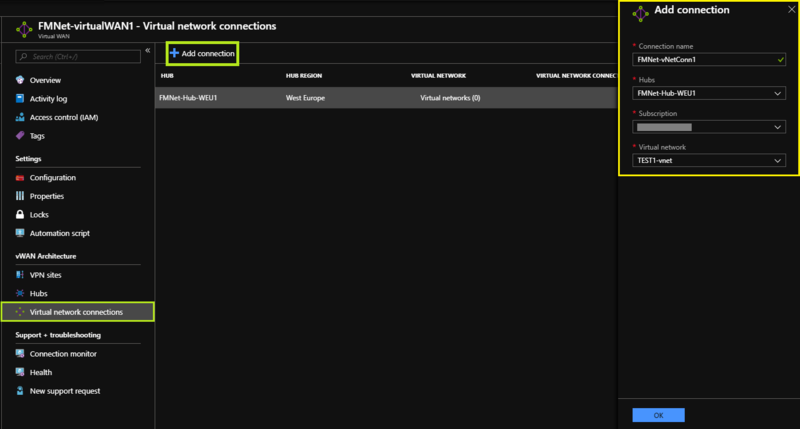 Currently you can create connections (peering) with virtual networks that reside in the same region of the hub. To configure the VPN on-prem device, you can proceed manually, or if you are using Virtual WAN partner solutions, the configuration of the VPN devices can occur automatically. In the latter case the device controller gets the configuration file from Azure and applies the configuration to devices, avoiding the need to proceed with manual configurations. It all feels very comfortable and effective, saving time. Among the various virtual WAN partners we find: Citrix, Riverbed, 128 Technology, Barracuda, Check Point, NetFoundry and Paloalto. This list is intended to expand soon with more partners. 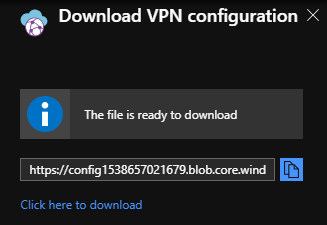 By selecting Download VPN configuration creates a storage account in the resource group 'microsoft-network-[location]’ from which you can download the configuration for the VPN device on-prem. That storage account can be removed after retrieving the configuration file. It also provides the ability to establish ExpressRoute connections with Virtual WAN, by associating the circuit ExpressRoue to the hub. It also provides for the possibility of having Point-to-Site connections (P2S) towards the virtual Hub. These features are now in preview. The Health section contains useful information to check the connectivity for each Hub. 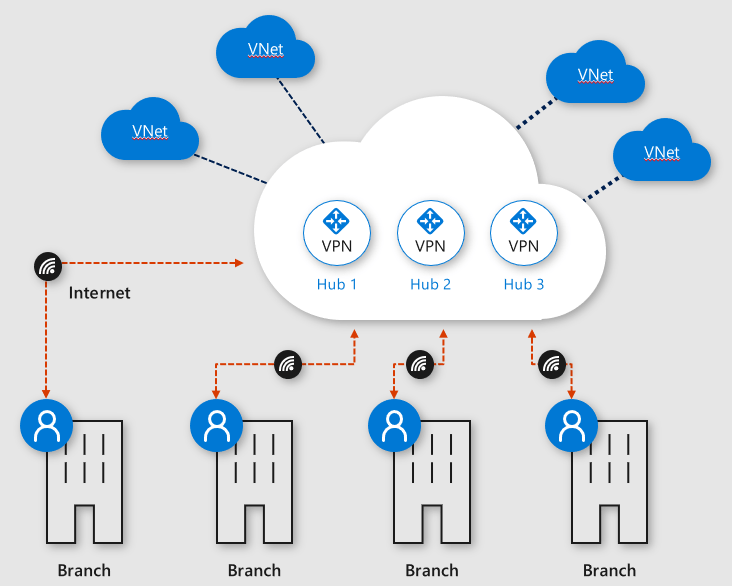 Virtual WAN is the new Azure service that enables centralized, simple and fast connection of several branch, with each other and with the Microsoft public cloud. This service allows you to get a great experience of connectivity, taking advantage of the Microsoft global network, which can boast of reaching different region around the world, more than any other public cloud providers. This entry was posted in Azure Networking, Cloud, Microsoft Azure, Networking on October 16, 2018 by Francesco Molfese.